Is the DataWindow Just For Displaying Rows and Columns? … Are You Sure? DataWindows are mostly used for displaying data in different kinds of presentation styles like grid, tabular, tree view etc. The DataWindow also has another great property: displaying shapes like rectangles, circles, etc. Moreover, these shapes can be created at runtime. In this presentation, Sonat Karakas of Turkcell will talk about creating shapes in a DataWindow, creating them dynamically and techniques for storing them in a database. At the end of the presentation, he will move up a notch by looking at displaying a server rack, showing its slots and painting them in different colors according to their usage status. Two system functions: Print and File, are supported. Key events for EditMask, SingleLineEdit and MultiLineEdit are supported. Print function for DataWindow control is supported. DragIcon property for all controls is supported. Manipulate the various features of Appeon WorkSpace, such as the AWS orientation, the title bar, the assistive touch bar, the log, the project information, the version number etc. Camera - Captures or views a photo using the device’s camera. Connection - Obtains the network state and connection type. Device - Obtains the device specific information, such as the device type, the device DPI/PPI, the OS version, the device’s memory, the device’s OS, the screen resolution, etc. Media - Plays a media file using the device’s media player. Notification - Sends a notification to the notification bar. Recorder - Records an audio using the device’s recorder or opens the recorder library. Import projects: supports importing an Appeon WorkSpace configuration file that will automatically configure the Project Name and URL for multiple projects. Run multiple apps: supports running multiple apps in the background at the same time. Logs: provides configurations for recording logs, clearing logs, and sending logs of a particular app via email. Default project: supports to set one app as a default app. If the app is set as the default app the app will be automatically launched when the Appeon WorkSpace is opened. Connection delay: provides the option to set the connection delay time. If the connection cannot be established within the specified time the users will be prompted. WorkSpace UI. Only English is available right now, other languages, such as Japanese, will be added in the future releases. View in landscape and portrait: supports to view Appeon WorkSpace in landscape and in portrait on iPad 2, iPad 3, iPad 4, iPad mini, iPhone 4/4S, and iPhone 5. New look and layout for Appeon WorkSpace! Retina display: option to enable/disable Retina support on iOS devices. When enabled, the UI including controls, text, and images, will not be scaled. As a result, the application will look very crisp at the expense of higher memory. Client log: configures the client-side log settings, including log mode and file size limit. Auto-resize: defines rules for automatically resizing the mobile application UI to fit various screen sizes and orientations (portrait or landscape) or uses Appeon’s default rules. Appeon WorkSpace Simulator: supports running apps in simulator of Appeon WorkSpace for both iPad and iPhone devices. Code Insight: accurately displays unsupported/supported features when writing dot notation in the script editor. Feature Analyzer: produces a report that accurately lists unsupported features. Config Wizard: a wizard that walks you through all the steps to configure your mobile project. • The new WCF client in PowerBuilder .NET. • The new WCF service type in PowerBuilder .NET. • The new REST client in PowerBuilder .NET. 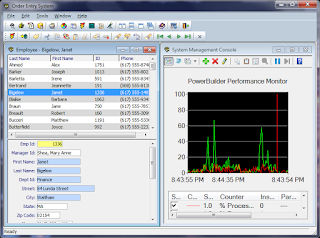 • Using a WCF client in an PowerBuilder .NET assembly to enhance PowerBuilder Classic. Software Tool & Die Inc (STD) is very pleased to announce that they have just released an updated version of their Foundation Class library today for both PowerBuilder and Appeon Web plus the first "official beta" for Appeon Mobile! The latest version contains the following updates and has been tested with Appeon 6.5.1 / 2013 using the PowerBuilder 12.1 / 12.5.1 official MR (maintenance) releases including PB's "Classic" and .NET versions. Testing inside of PB has also included WebForm, Winform, Win32 and Smart Client deployments. New SMC feature in action! Removed some old WinNT/Win2000 commented out code. Replaced the following INI vaules in the "[System]" section. They are no longer PocketBuilder or DBMS specific. 1) Changed the parameters in the "[SYSTEM]" section of the INI to compliant with other FC variations. 2) Restructured all the Menu Classes to get ready for new CLF (Section 508) website construction techniques (coming soon!). This will support any type of website look & feel! 2) Restructured all the Menu Classes. Note: There will be another release of the FC's soon! Stay tuned to this blog for more news releases! 1) Converge PB, Appeon Web and Appeon Mobile into a single source framework. 3) Port the EAServer version of the framework to .NET for web service based NVUO support! This will be an MVC Architecture as already implemented in EAS. 4) Integrate Open Source tools like Spell Checking, OCR, Imaging and more! Web Browser version of the PowerBuilder CD player released! This release is written in PowerBuilder 12.1 (build 6518 - GA) and encompasses some interesting features that you can coax out of the Windows operating system. Normally, the application can be deployed as a Win32, Winform or WPF (using PB.Net) and allows the user to control music from any CD/DVD player attached to their PC. The amazing part of this story though is use of the Appeon Web product and it's ability to be able to translate the PowerScript based application into pure XML, HTML and jScript - thus totally removing the PBVM run-time dependency. Then, being able to reproduce verbatim the application GUI inside the web browser while the Appeon AJAX plugin allows any web application the absolute necessary O/S control to accomplish its task! Actual screen capture of the Appeon Web CD player at work! Using Appeon Mobile and the same baseline code you can also deploy to a Mobile device! So not only is this a "kool" application to run natively, the important aspect to consider when building a PB application with plans to webify is that if you need low-level control to use a scanner, bar code reader, camera, GPS, etc Appeon's unique architecture (*). Appeon Sam I am, That Sam-I-am! I could not build this in a box. I do not like it built with Delphi. I do not like it built with VB. I do not use WPF for that here or there. I do not even use Webforms anywhere. I do not like Visual Studio's C# and ham. I do not like them at all, Appeon Sam-I-am. If you would like to enjoy the Native or Web version of the above CD Player application, please visit the SourceForge website and my STD-Foundation-Classes project. Then select "All Files" to drill down to the PowerBuilder or Appeon sections. All the code in this project is free & open source. For information on a Free Version of Appeon Developer, join ISUG at the "Green ($99) or Gold" level and receive Appeon as part of your membership! President: Software Tool & Die Inc.
• Using a WCF client in a PowerBuilder .NET assembly to enhance PowerBuilder Classic.